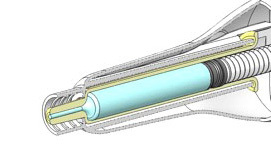 Example: Filled on site Preciquant™ Injector for surgical use. Device is delivered empty, filled on site just before it is applied. Distributes liquids, viscous products, gel, paste and devices. Can be mounted with a needle, cannula or custom tips. Effortless delivery of viscous products. Examples: drugs, special treatments, oncology, antibiotics, bone grafting, collagen, hyaluronic acid, adhesive, radioactive products, stent, RFID cartridge, bio implants, Laparo Endoscopic Single-Site Surgery (LESS), Natural Orifice Translumenal Endoscopic Surgery (NOTES), Fast Track Surgery & Robotical Surgery. The Preciquant™ can be use as an endoscopic delivery tool to deliver a mastered dose on a precise location. Device is adapted to the procedure, the trocar and the product to be delivered. The patented Preciquant™ Injection system expels liquids, viscous products, gels or paste. This is made possible by the lever that multiplies the injection force and allows a comfortable, strength free, dose per dose delivery of the product up to 100'000 cps (Centipoise). The patented Preciquant™ Injection system is compatible with refrigerated products and refrigerated shelf life. The Preciquant™ dispenser can be equipped with technology that does not allow oxygen to enter the container. The efficiency of the product to dispense is preserved and the treatment efficiency is increased. Preciquant™ is a wrist manipulated product. This increases flexibility and precision while diminishing arm weariness. Preciquant™ is intended to increase comfort and possibilities of use. Preciquant™ is designed for all sizes of hands. All Primequal products are award winners within their field of application. Use of Preciquant™ technology for surgical application was first part of an EU FP7 Research Grant that demonstrated that the surgical procedure could be enhanced with a Preciquant™ delivery tool: dose mastery, precision of the delivery spot, effortless delivery of viscous products, speed, superior fillings, use of long cannulas and enhanced tactile feedback during the procedure. The Preciquant™ is adapted to the customer's current manufacturing process. It can be integrated in the process without requiring a new qualification and validation of the process. In some medical products the manufacturing process is strongly linked to the container (primary packaging) that can be for example a glass vial or a cartridge. For this kind of specific application there are some versions of the Preciquant™ where the front part is no longer the container but becomes a container carrier (secondary packaging), such as for the dental anesthesia application or hyaluronic acid.